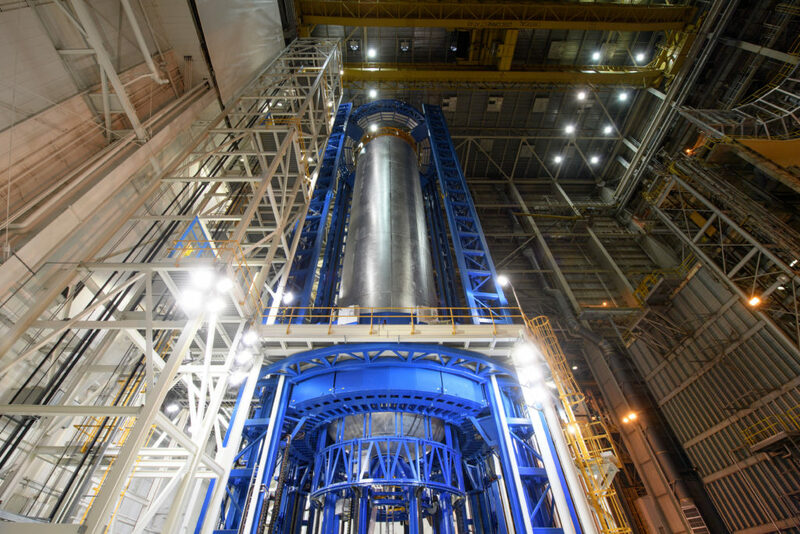 September 21, 2016 – The largest rocket stage in the world is coming together piece by piece at NASA’s Michoud Assembly Facility in New Orleans. Large elements for NASA’s Space Launch System are in production and will be joined together to create the rocket’s 212-foot-tall core stage, the backbone of the SLS rocket. Why is NASA building the world’s most powerful rocket? Because SLS is ready to support both near-term missions in the proving ground around the moon starting in 2018, while at the same time being capable of carrying the very large hardware like landers, habitats and other supplies and equipment needed to explore Mars and other deep space destinations in the 2030s and beyond. “Building the core stage is similar to building a house,” said Joan Funk, SLS core stage lead at NASA’s Marshall Space Flight Center in Huntsville, Alabama. “With the massive, welded elements coming off the Vertical Assembly Center at Michoud, we’ve laid the foundation, framed the walls and put up the roof. The big items are in place. Now it’s time to get to work on the inside.” That’s where engineers will clean and prime each element before beginning the internal integration. 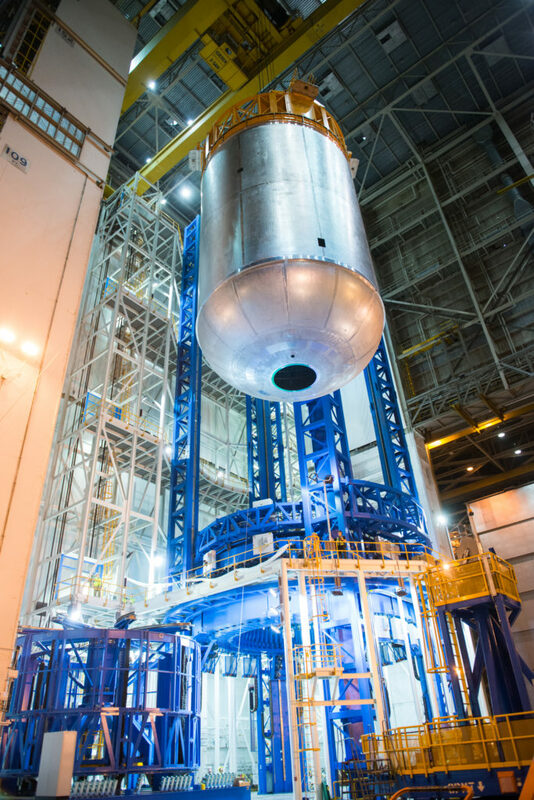 Michoud’s Vertical Assembly Center, the largest spacecraft-welding tool in the world, is welding many of the core stage’s main elements — the forward skirt, the liquid oxygen tank, the liquid hydrogen tank and the engine section. The core stage’s fifth element, the intertank, which is bolted, is also being built at Michoud. The Boeing Company, headquartered in Chicago, is the prime contractor building the core stage, but to build the stage, Boeing has worked with 442 businesses across America, including 297 small businesses. The final manufacturing processes and outfitting for each part of the core stage varies with the section’s function. Wet structures — elements that hold fuel, or the liquid oxygen and liquid hydrogen tanks — are put through “proof tests” to assure manufacturing quality. The liquid oxygen tank is hydrostatically tested and filled with water; and the liquid hydrogen tank is pneumatically tested. After testing, the tanks and dry structures — elements that don’t hold fuel, or the forward skirt, intertank and engine section — are cleaned, primed and readied for the “work on the inside.” Much like a house being constructed, the core stage is outfitted with wiring, plumbing and insulation. The dry structures house flight computers, cameras and avionics — or the “brains” of the rocket. In a house, wiring can carry power or television and internet data from room to room. In the SLS’s core stage, 45 miles of wire cabling serves a similar purpose, carrying power and data from element to element powering flight computers, cameras, sensors, avionics and other electronics housed in the dry structures. The core stage’s plumbing contains lines that deliver the propellant and oxidizer from the tanks to the engines. Each dry structure also contains purge vent lines and hazardous gas lines designed to eliminate dangerous gases building up in the dry structures prior to launch. “The dry structures are cram-packed full of equipment and the domes of the tanks take up a lot of the room inside the dry structures,” said Funk. Racks, cameras, sensors, vent lines, wire cabling, valves, shelves, couplings, and more fill the core stage’s dry structures to near capacity. With every inch planned, equipment is mounted and wiring is placed methodically, accounting for time, space, accessibility and much more. When the dry structures are ready to be “stacked,” or joined to the other elements, there isn’t much room to spare. Before the elements can be stacked, insulation — which is more important to a rocket than to a house — is applied. Not only does NASA’s thermal protection system give the rocket its signature orange color, but more importantly, it protects the core stage from the extreme temperatures encountered during launch and maintains the fuels’ extremely low temperatures. The liquid hydrogen is chilled to minus 423 degrees Fahrenheit and the liquid oxygen is chilled to minus 297 degrees. When complete, engineers “break over” the sections, or move them to a horizontal position, for their final assembly. Final wiring, plumbing and insulation are installed after the forward section is joined to the aft to complete the core stage assembly. Before punching its ticket to launch, the core stage will travel by barge to NASA’s Stennis Space Center near Bay St. Louis, Mississippi, where it will undergo a free modal test to understand the structure then be mounted in the recently renovated B-2 Test Stand for propellant fill and drain testing and hot fire testing called a “green run.” A green run, or the first time the engines are assembled into a single configuration with the core stage and fired at nearly full-power, tests the compatibility and functionality of the system to ensure a safe and viable design. Once post-test assessments and adjustments are complete, the core stage will travel again by barge to NASA’s Kennedy Space Center in Florida, for its first flight with Orion.